The formal, semi-double flowers of this gorgeous variety are mainly a pale blush pink or white, but each petal has a darker pink edge, which gives them a distinctive bi-coloured effect. They look very pretty when in flower in late winter and early spring and they make a striking focal point in a seasonal planting scheme. Their glossy evergreen foliage also makes them a valuable garden shrub, which will provide structure and interest throughout the year. Alternatively find a large pot and fill it with ericaceous compost and you will have a super specimen for the patio. buds stubborn to flower so far, but looks healthy enough and established without issue. A very good plant, covered in buds so I grew it on in a cold conservatory before putting it outside. Flowered for ages, quite beautiful. the plants were in excellent condition. They had been packed with care and were none the worse for making a long journey. Delivered promptly. Hi, I bought Camellia Japonica Desire in your sale a couple of years ago. It came with one flower on it and it has never flowered or even produced a flower bud since. It is in a large pot with ericaceous soil and some of the leaves turn yellow and fall off. I've recently dug a new border so am thinking of planting it into that to see if that makes any difference; although the soil there is pretty wet. Any suggestions? Thanks, Marion. Hello, There are a number of reasons why a plant won't produce flowers, but the most likely causes are either not enough sun, water or fertiliser. I am not sure why your camellia is not flowering, but as camellias produce their flower buds in summer, they are particularly susceptible to drought at that time of the year - and this could be compounded if the plant is growing in a pot. we have a camellia desire which the flowers are going brown and falling off .will repotting in a bigger pot help ? the leaves are nice and green and it as been well watered ? Hello, It is the end of their flowering period, so I would expect the flowers to be dying back at this time of the year. Potting up (using ericaceous compost) is always a good idea though if you feel it may be getting cramped in its current pot. When can I prune my Camellia? I have a Camellia on my west-facing balcony in London. It is huge and laden with flowers but I'd love to know when I can cut it back to ensure I don't damage it. Mature Camellia's generally require very little pruning, but any that is necessary should be tackled after they have finished flowering, but before the growth buds break. What plants do you recommend for a gift? Please can you advise me..... I would like to send a gift of to some friends who have just moved into a new house. I would like to send them something that is long-lasting. Do you have some suggestions? Which Camellia is best in a pot? I would like to order a red Camellia to put in a pot, and wondered if you would recommend either the Anticipation, or the Adolphe Audusson (or something else entirely). The pot isn't huge, so a slow grower would be best. Most Camellias are fine in large pots (ones at least 45cm in diameter), but if your pot is smaller than that, then I'm afraid I wouldn't recommend keeping a Camellia in it for longer than a few years. The two I would particularly recommend are Camellia japonica Elegans http://www.crocus.co.uk/search/pl/?ContentType=Plant_Card&amp;ClassID=617&amp;CategoryID= Camellia sasanqua Sparkling Burgundy http://www.crocus.co.uk/search/pl/?ContentType=Plant_Card&amp;ClassID=627&amp;CategoryID= These are not as fast-growing as 'Anticipation' and do not grow as large either, which makes them more suitable for pots. 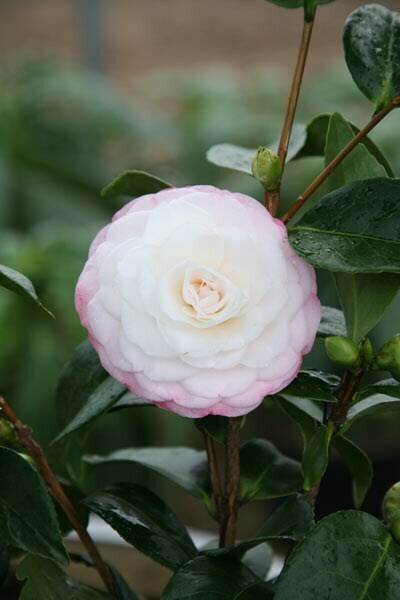 Also when you do plant up the Camellia, make sure you use ericaceous compost as all Camellias prefer an acidic soil. Dried up buds fail to open then turn hard and brown. They are covered lots of tiny black bristly growths, which are full of spores. The plant is healthy in all other respects. The plants most commonly affected include rhododendrons, azaleas and camellias.